I’ve written a lot about “superbugs” from factory-farmed meat, as well as “superweeds” and “superinsencts” from genetically modified crops. Turns out, industrial agriculture is wreaking similar havoc in the sea. What do I mean? Consider the salmon, that noble family of fish, which has evolved over the millennia alongside an ignoble parasite: the sea louse. Often less than a centimeter long, the sea louse operates like the land louse that bedevil humans: by attaching itself to the skin of the host and then chomping down and sipping its blood. Happily, wild salmon and sea lice populations achieved a rough balance over their time on the planet—wild salmon developed resistance to the point that sea lice can do their thing without causing significant harm. That was the state of things, anyway, until the emergence of industrial-scale salmon farming in Norway in the 1970s. In industrial salmon production, the fish are stuffed together by the hundreds of thousands in pens open to the coastal sea. These conditions provide a veritable banquet for sea lice—rather than having to scour the sea for their hosts, the parasites find their targets wriggling around en masse in one place. Left to their own devices, the industry discovered, the age-old parasite-host balance is upset, and farm salmon populations succumb to sea lice. Undaunted, producers resorted to a prized tool of land-based industrial agriculture: pesticides. The idea is simple: If farmed salmon can’t fight off sea lice with their own defenses, dump toxic chemicals into the feed (or directly into the pens) to do the job for them. The practice worked well enough as the farmed salmon industry exploded in size and—still dominated by a few large Norwegian firms—set up shop in Chile, the United States’ Pacific Northwest, and Canada. The explosion in production turned salmon from a luxury food to an everyday staple. Today, 90 percent of salmon consumed in the US comes from vast farm operations. 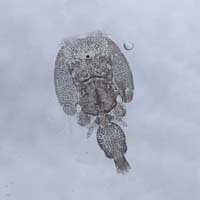 Lepeophtheirus salmonis (sea louse) Watershed_Watch/FlickrBut—surprise!—sea lice are constantly adapting to the poisons used to control them, forcing the industry to ramp up pesticide doses and search for novel poisons. In Canada, source of 40 percent of the farmed salmon consumed in the United States, the sea lice appear to be winning. To rid salmon of the lice, fish farmers spike their feed with a strong pesticide called emamectin benzoate [the chemical name for Slice], which when administered to rats and dogs causes tremors, spinal deterioration and muscle atrophy. The United States Food and Drug Administration, already hard-pressed to inspect imported Asian seafood for antibiotic and fungicide residues, does not test imported salmon for emamectin benzoate. In other words, the farmed salmon in nearly every American supermarket may contain this pesticide, which on land is used to rid diseased trees of pine beetles. It is not a substance I want in my body. While sea lice and their pesticides duke it out in Canada’s salmon cages, one sure loser is emerging from the battle: wild salmon, which once flourished along the area’s coasts and streams. The rough balance between wild salmon and their parasites evaporates in areas of intensive salmon farming, where sea lice populations boom. We show that recurrent louse infestations of wild juvenile pink salmon (Oncorhynchus gorbuscha), all associated with salmon farms, have depressed wild pink salmon populations and placed them on a trajectory toward rapid local extinction. The louse-induced mortality of pink salmon is commonly over 80% and exceeds previous fishing mortality. If outbreaks continue, then local extinction is certain, and a 99% collapse in pink salmon population abundance is expected in four salmon generations. These results suggest that salmon farms can cause parasite outbreaks that erode the capacity of a coastal ecosystem to support wild salmon populations. Collapsing wild salmon stocks, of course, are treated as an “externality” by the salmon industry: a cost of production borne by society as a whole, not by producers. And if those megafarmers get their way, the Globe and Mail reports, Canada’s salmon farms will soon be using a lice-targeting pesticide called AlphaMax that Environment Canada, the country’s version of the EPA, has identified as a threat to wild lobster stocks. Farmed salmon may be cheap at the grocery store, but its true costs are proving high, indeed. *Correction: This story originally reported that the lice problem had gotten out of control in salmon farms on Canada’s west coast. Actually, the problems are on the east coast. The text has been corrected. I regret the error.